Max Headroom in the flesh… so to speak. Max Headroom is set in a near-future world (a mere “20 Minutes into the Future,” as the tagline proclaims) where television is king, and most other technology has fallen by the wayside. There are over 10,000 channels now, and ratings are a life or death matter for most of the networks, including Network 23, where our protagonists are centered. TVs no longer have off switches, for example, and the driving goal is to keep advertisers happy by any means necessary, even if that means endangering viewers with the use of things like “blipverts” that can literally cause spontaneous combustion. Edison Carter is a crusading journalist who works for Network 23 doing dangerous reports, and is allowed free rein mostly because of the massive ratings he draws in. The execs come close to pulling the plug in the first episode, and he’s nearly killed in a crash as a result, being put into a coma by a raised gate, with the last words he sees being “Max headroom” (i.e., the clearance). 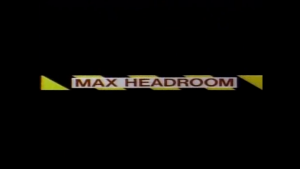 When the hacker responsible for the crash tries to dump his mind into the computer, it creates the character Max Headroom, named after his first words. Max is a glitchy, unrestrained version of Carter that treats everything like a show, and while Carter does eventually wake up, the two remain separate characters. Both Max and Carter are played by Matt Frewer, whom Trekkies might recognize as time traveler Berlinghoff Rasmussen from TNG. Rounding out the cast are his “controller” at the station Theora Jones (Amanda Pays, also known as The X-Files’ Phoebe Green), producer Murray McKenzie (Jeffrey Tambor, better known now as George Bluth Sr. from Arrested Development), and Bryce Lynch, the aforementioned hacker. Other familiar faces include Rosalind Chao (Keiko from DS9) as a fellow reporter, W. Morgan Sheppard (who had a number of Trek roles, most notably as Data’s “grandpa” Ira Graves) playing a pirate TV broadcaster, and Andreas Katsulas (G’Kar from Babylon 5) as a Network 66 exec. The recently deceased George Coe was also in the show as Network 23 executive Ben Cheviot; he voiced Wodehouse from Archer until his death a few months ago. RIP, George. 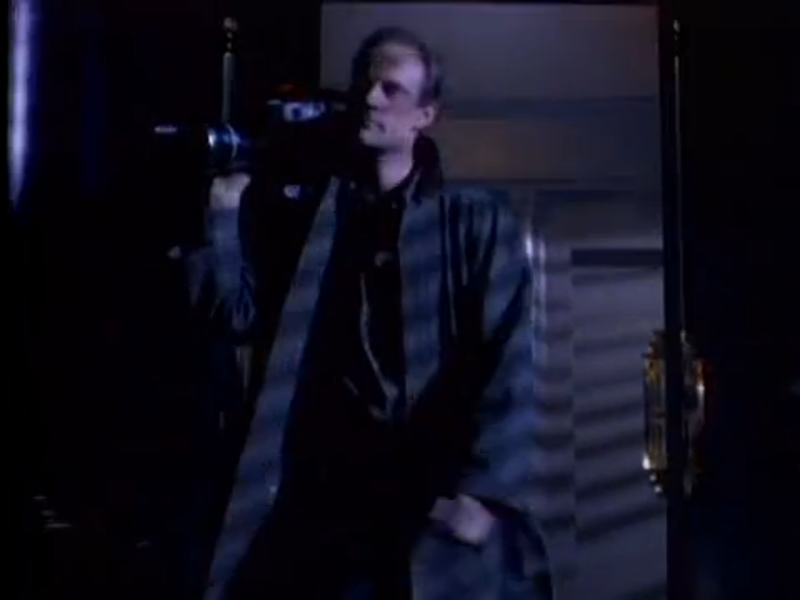 Matt Frewer as Edison Carter, Intrepid Journalist. Like I said before, the show and character’s origins are complicated. It started as a pilot movie on the UK’s Channel 4; this version is available on youtube and is very similar to the first episode of the series, with some shots (particularly graphics) reused in both. The main differences are in the atmosphere, as the UK version feels a lot more sinister (Bryce in particular comes across as far more malevolent), as Edison Carter isn’t so well off after his injury this time. Max ends up outside everyone’s control, but whether this is a bad thing or not remains unresolved since he’s driving their ratings through the roof. While the pilot wasn’t picked up, Max lived on as the “digital” VJ host of a music video show, and later a talk show where he interviewed people like William Shatner. Only then, after both these shows had come to an end, did the (American) show we’re reviewing today come about, with Max back in his own fictional world. 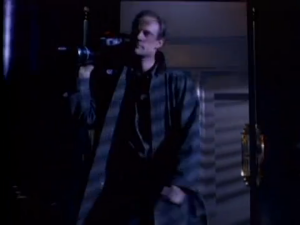 Three actors carried over from the original pilot movie: Amanda Pays as Theora Jones, W. Morgan Sheppard as Blank Reg, and of course Matt Frewer as Edison Carter/Max Headroom. Everyone else was recast for the series. Okay, that was a lot more background than usual, but there’s still so much more to the whole situation. We’ll have time for that later, though. This whole premise sounds laughable now, with TV’s influence waning with each passing day, eclipsed by the internet in general and streaming video in particular, but everything is so exaggerated into this satirical world that it still resonates today. You can easily imagine “TV” being replaced with “internet” and changing out all the appropriate words (“channel” for “website,” etc.) and it’d be pretty damn close to reality. The only thing they couldn’t really have predicted was the 24 hour news cycle and the effect that would have on journalism; Edison Carter would never be allowed on a modern news broadcast. Too invested in the truth over spinning a narrative or manufacturing FUD. A lot of the executives and advertisers in-universe do seem to want to move TV in that direction, though. Max really is as witty and entertaining as everyone claimed him to be. Matt Frewer is, quite frankly, brilliant throughout the show. He was supposedly picked for his ability to improvise, and that’s no doubt where most of Max’s charm comes from. Max and Edison are distinct characters while maintaining the core similarities that come from their shared memories. It’s always interesting to watch the two of them argue or have conversations. Max’s situation also enables some fun leaning-on-the-fourth-wall style jokes, acknowledging commercial breaks and a kind of in-universe commentary. The world is gloriously dystopian in the purest 80’s cyberpunk sense of the word. Japan is the major economic power (embodied in the show through Zik-Zak), everything’s dark and grungy a la “high tech/low-life”, noir style lighting, big CRT monitors and mechanical keyboards with overdone 80’s graphics. It’s the closest thing to Blade Runner being brought to TV, stylistically. 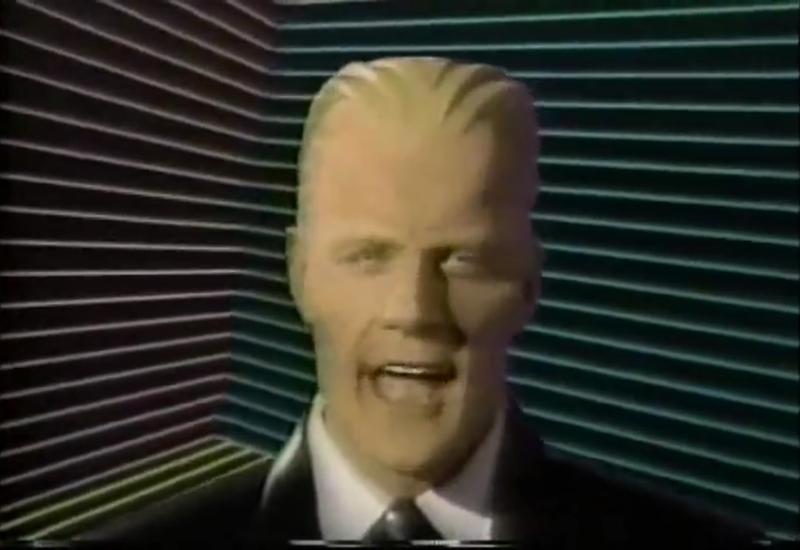 Given Max Headroom is native to the 80’s itself, that makes it all feel more authentic than, say, when Total Recall 2070 or Charlie Jade did it. The effects used for Max aren’t actually CGI; rather, it’s a complex makeup and prosthetics set mixed with a hand-drawn wireframe background on a bluescreen. This actually turned out great for the show, allowing it to hold up over time much better than if it was CGI. The conversations between Max’s prerecorded footage, being played on TV screens, and the characters on set flow amazingly well. It never feels like they’re talking to an empty screen. How well these are pulled off is part of what make Frewer’s skills shine. Most of the technology introduced isn’t forgotten about, and so it ends up playing a role as the show moves on. For example, one episode deals with a network executive trying to use the technique that generated Max to preserve his mother’s mind, and then transfer it to a younger body, granting effective immortality. Max was serendipity, but unlike so many other sci-fi shows, people have actually tried to replicate the results and put it to use. Later on, another group (a church) tries to play it off as if they’ve figured it out and can dump people’s memories to live on, Max-style, until a way to revive them with bodies is achieved… in exchange for a generous donation, of course. If you watch the British pilot and compare it with the first episode of the series, you will positively weep at what was lost in moving over. ABC, as the American broadcaster who picked it up, wanted it to be more in line with your average 80’s show, and so some of the “edge” is lost in the process. I mentioned how much less sinister it feels, and that’s most obvious in the character of Bryce. The British Bryce is absolutely obnoxious, true, but he’s also flat-out malevolent in his actions. He’s deliberately trying to kill Carter. The American Bryce, however, comes across as more of a naive kid, and the scene where Carter is injured is played off as if it’s an accident when things got out of hand. The evilness of the network is also downplayed heavily; given the pilot movie has them discussing how to get rid of Carter, and in the show Cheviot frequently defends him, it’s a huge difference. The show managed to work its way back towards that point in season 2, but given how short it was, it’s a real shame that we didn’t get to start there. While it doesn’t end on a cliffhanger like so many other shows, it doesn’t exactly have an ending, either. As noted above, it’s clear that season 2 was building to a few things and it’s a little disappointing we never got to see it come to fruition. 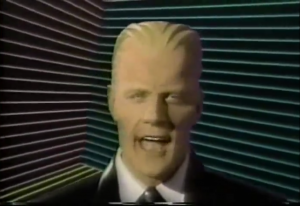 Honestly I don’t have much bad to say about Max Headroom. I loved it all the way through, and smart satire like this is something that’s important in any day and age. It’s made all the better by the fact that so many of the problems it tackles are still relevant today. 5/5 UFOs. A forgotten classic that never got a fair shake. A quick reminder of my rating system: a 5 represents must-see–a “hidden gem,” as it were. A 4 is good, solid television. A 3 is “cult classic” stage, where the show’s appeal is likely limited to a specific group. A 2 is flawed, but fun, or even “so bad it’s good,” depending on the series and its release timeframe. A 1, of course, is avoid at all costs. 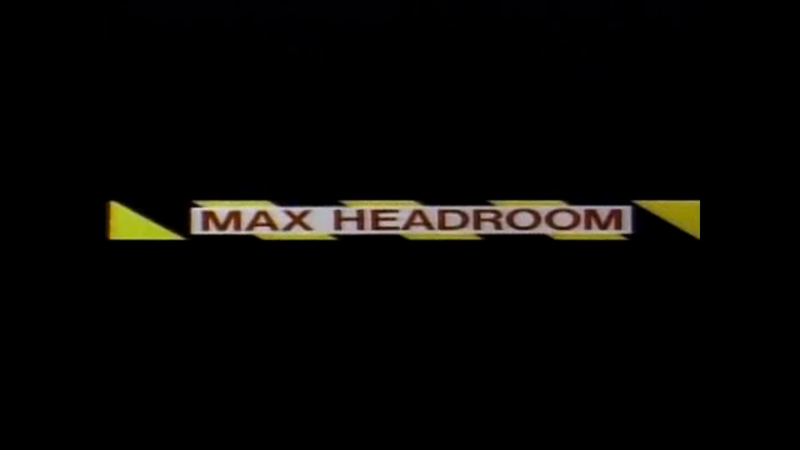 Max Headroom was only recently released on DVD, and isn’t on any of the major streaming services. For a long time the only way to watch it was low-quality rips on youtube, but as of 2017 those are gone. It’s also worth watching what episodes and interview clips of the original VJ/talk show still exist, if you enjoy the series, too. Lastly, if you decide to watch the original pilot, you can do that here. Our first five UFO rating on the site! Yay! That’s all for the Primer this month, but it won’t be the last we see Max. Have any suggestions? Or are there any little known shows you’re a fan of that you’d like me to cover? Leave them in the comments, or send a tweet to @RetroPhaseShift. To be notified of the next entry in the Subjectively Obscure Sci-Fi Primer, you can subscribe to the RSS feed by clicking here. it was exciting to see the first five out of five review. this was really fascinating, as i completely agree that max is a character who everyone seems to recognize but nobody has actually seen his titular show. i definitely fall into that category so i appreciated the info.